Water needs: Water when soil is dry 2 inches down; water deeply but infrequently. 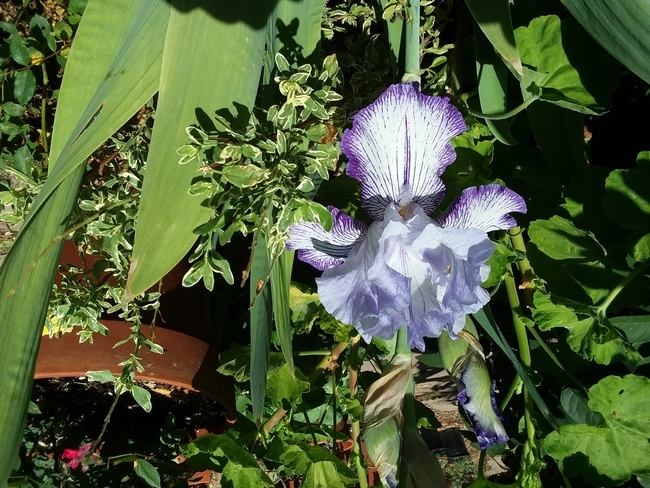 Iris are perennial plants that grow from bulbs or rhizomes. Of three main categories of Iris that grow from rhizomes (the other two being Beardless and Crested), Bearded Iris are the most widely grown. The flowers are showy, generally with three inner segments and three droopy petals, each with a fuzzy spot, or beard, near its base. Colors include purple, red, pink, yellow and white, and combinations abound. Leaves are tall, green sword-like fans. The rhizome stores nutrients during the dormant season. In locations where winters are mild, plant the rhizome in the fall in well-drained soil in the ground or in containers with minimum 12 inch diameter and a drainage hole. Loosen soil to 2-3 feet so roots can get deep before rains. Plant in full sun in cool climates, in hottest regions they will accept light shade during the afternoon. Place rhizomes just below the soil surface with leafy end up, spreading roots out, spacing rhizomes 1-2 feet apart or in clusters 18-20 inches apart. Fertilize with a 10-10-10 or 5-10-10 water -soluble fertilizer when planting (do not let the fertilizer touch the rhizome, it may burn) and once more after blooming begins. Spray with water or insecticidal soap if aphids or other pests appear on leaves; stop applications when pests are gone. Once the bloom is finished, cut the stalk to the ground and leave the green leaves. This will allow the nutrients to be absorbed into the rhizome to produce next year's blooms. Cut the foliage in late summer or fall when the leaves are entirely yellow. Rhizomes can be divided every 3-5 years to prevent over-crowding. When dividing, dig up the rhizome, cut into 3-6-inch pieces with both leaves and white roots. Replant 12 inches apart, just below the surface of the soil.